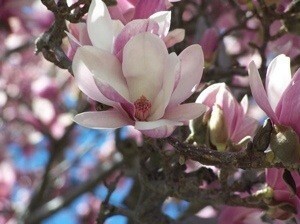 The Magnolia tree was magnificent! Each blossom sang out to me. Take my picture, no take my picture. Oh, which one to choose, they were all so beautiful, so settled on the silent and quiet one. Source: Visiting a friend, she has an awesome garden. Our oldest daughter usually has a photo to share with me every morning by email, and most often, the photos are of my granddoggie Sadie Belle or their garden. I opened her Happy Mother's Day email to find this photo and the message, "I wish I could be giving this to you in person, Mom. Have a wonderful day. We love you." Needless to say, I shed a few tears, but thoroughly enjoyed seeing this beautiful magnolia blossom. 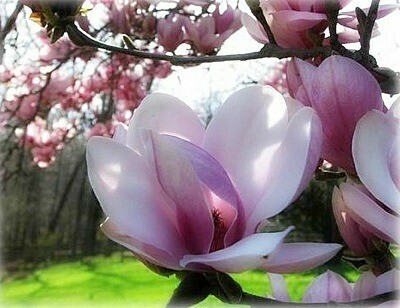 They have 3 magnolia trees which are just laden with blossoms this year. 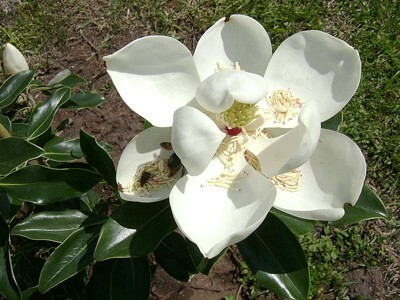 They are one of my favorite fragrances, along with orange blossoms and gardenias. I hope every one of you out there had a memorable day too. Making memories is at the top of the list of things to do for every family, or should be. Sharing them with others is second on my list. So perfect. Looks almost like wax. Thanks for sharing the photo and the sweet story. You are a lucky lady. Wow! You are so blessed to have such a beautiful tree. I'd love to have one, but I think our winters are too cold.